I am on day three of a four-day Bookman birthday weekend. Yesterday was the actual birthday and it turned out to be a mixed bag that involved burning a pot of pinto beans, being attacked by bees, a delicious birthday cake and the start of a new tattoo. The cake. I baked it. Bookman wanted chocolate cake with strawberry jam between the layers and vanilla “buttercream” frosting. I baked the cake Friday and made the frosting Saturday. 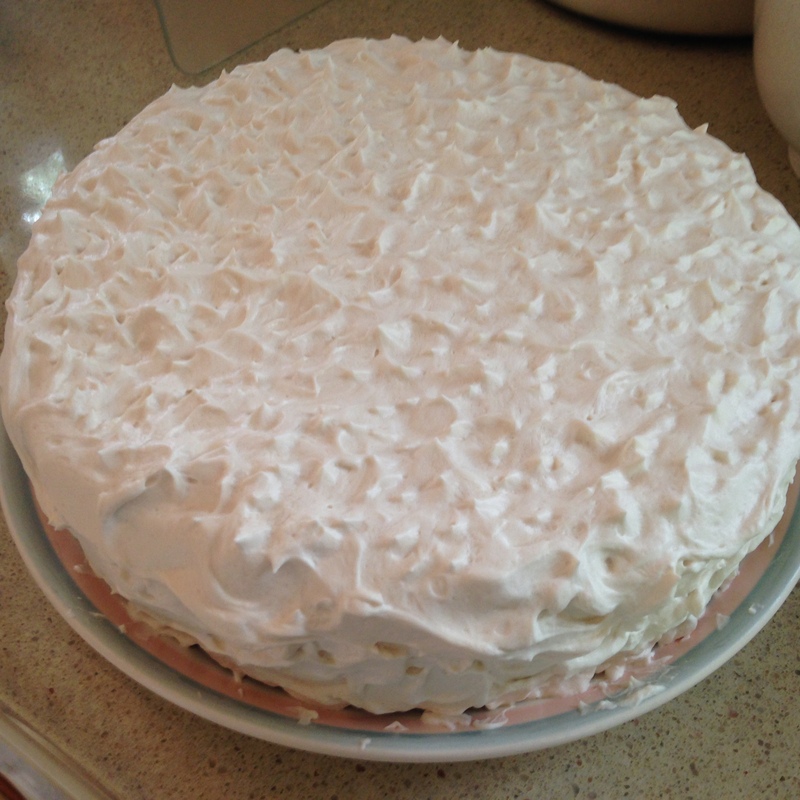 It all came out great even though I read the recipe wrong and didn’t put enough sugar in the cake. Due to the amount of sugar in the frosting, this really was not a problem. All I can say is, it is a good thing we don’t eat cake like this very often because — holy cow! — so much sugar and vegan butter it made me cringe. We spent time out in the garden yesterday. Bookman was weeding the pumpkin patch and came around to a grassy corner of the patch and inadvertently disturbed the home of ground nesting bees. They hide the entrance to their nest so well and we have bees flying all over the garden all the time it is hard to notice a nest anywhere. But Bookman found it and when he did the bees attacked him. Nine stings. And one that came into the house with him unbeknownst to us was discovered by Dickens who pounced on it and himself got stung. Bookman and Dickens are both fine, though Bookman was a little worse for the wear. No allergic reaction, thank goodness! He had a tattoo appointment last night for the start of a new tattoo that will cover most or all of his arm. The work is to look like tree bark. I joked and asked him if he is going to want me to start calling him Groot. One of the bee stings is on the arm that was tattooed and it hurt a little extra when the artist worked on that spot. The art is not done, there will be another two appointments at least. But a good beginning was made and Bookman is pleased with it. The garden is crazy wild right now and we can’t seem to catch up with all the weeding that needs to be done. Of course the bee attack didn’t help. The zucchinis are looking great. We have a tiny pumpkin starting already. All of the garlic is picked and we will have enough to last us for months. The bush cherries are ripening and I am picking regularly. This is the first year there has been enough to bother picking, and goodness, there is a lot. Or maybe it just seems like a lot since I’ve not had any before so I’ve no comparison. It is quite exciting though. I thought drying them for use in cereal and muffins and cookies was a great idea but Bookman insists a pie is in order. Perhaps there will be enough for a pie and leftovers for drying. I don’t know if anyone else has noticed but cherries are the new superfood. They are showing up on nutrition blogs and cycling websites. It is cherries, cherries, cherries! I guess goji berries are no longer that exciting. I don’t follow the superfood trends, I think it is rather silly actually. Just eat a variety of whole foods and not so much cake and all will be well. The superfood thing is nothing but fadish and that is not a good way to eat. However, that cherries are the THING right now, means lots of tasty recipes floating around the interwebs so there’s that. It is bean harvesting time! The beans this year are doing great. I’ve got yellow wax beans and purple bush beans and masai green beans and rattlesnake pole beans. The pole beans were a let’s plant them and see what happens thing because the seeds were a couple years old. The past few years I grew them in the corn patch and they never did all that well. but this year, on their own in a patch with bush beans they are going crazy! I have rattlesnake beans coming out me ears. They are bigger than the bush bean/green bean type of bean and are crunchy and more substantial in the mouth. Quite tasty and saisfying. I will definitely make these beans a garden staple from here on out. We are about to get our first slicing tomato. It is almost ripe. There have been cherry tomatoes for a couple of weeks, sungold is the variety. They are about the size of a grape, ripen to a yellow-orange and sweet as can be. They are a hybrid variety, something different for us since we usually only grow heirlooms. But I have heard raves about this one so figured we would give it a try. Not sure if we will grow it again, but it is a good one, we just can’t save the seeds to plant next year since hybrids do not grow true. If you are not a seed saver though and looking for a sweet little tomato, give it try for sure. 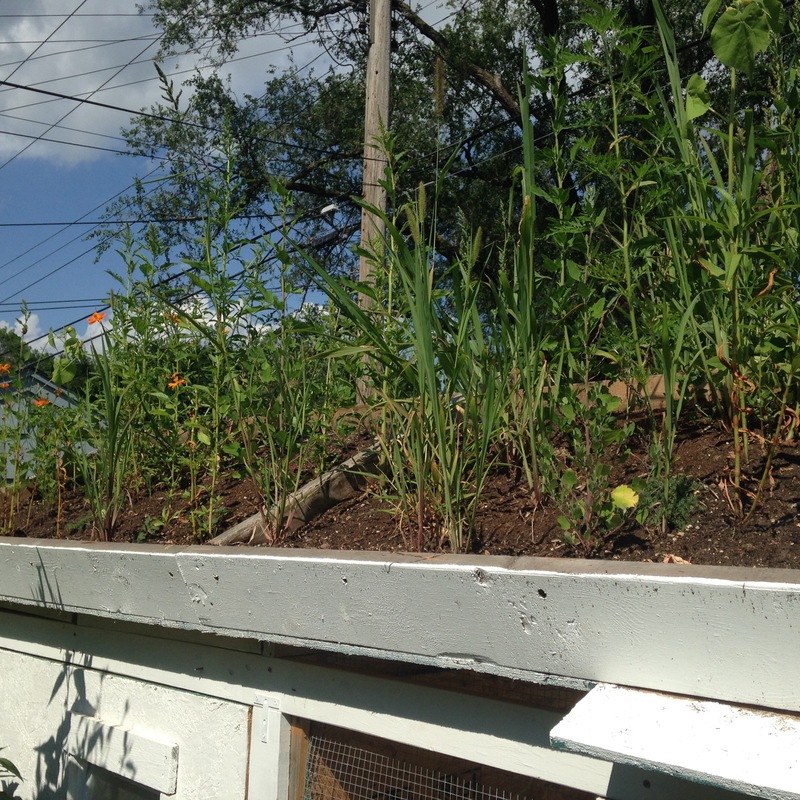 Green roof – weeds are green right? Part of yesterday’s gardening was to be weeding the green roof but that didn’t happen due to the bee incident. It did not happen today because it is laundry and chore day and was too warm by the time I was done with everything else to do any weeding. But one of the nice things about taking extra days for a long weekend is that it isn’t over yet. Tomorrow morning there are no chores or errands planned so directly after breakfast it is out into the garden until it is too hot or I am too tired or hungry. The forecast for the week promises a return of heat and humidty, not like the heatwave of a couple weeks ago, but hot and humid enough to be steamy and generally uncomfortable outdoors. The garden will love it. I will not. The chickens will get more popsicles. Tuesday evening is National Night Out so we will spend a bit of social time with our neighbors at a block party just down the street. 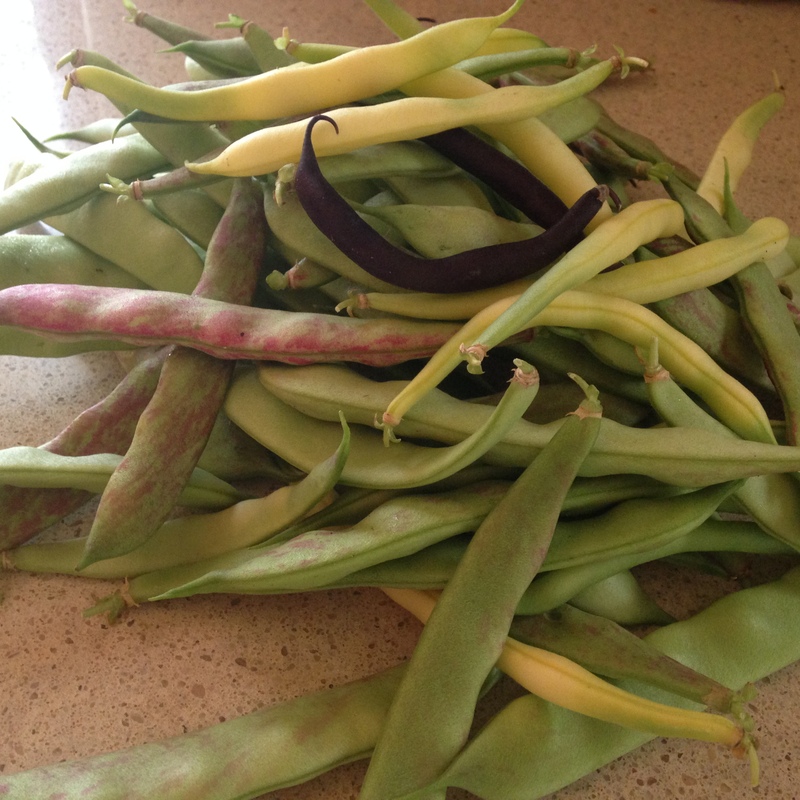 Maybe Bookman can come up with a potluck dish of beans from the garden. Or we will just bring cookies like we did last year. Happy Birthday to Bookman. What a shame about the bees though, I now feel very lucky that I didn’t get attacked last year when I disturbed a nest. Your garden sounds a lot more prolific than mine! Birthday wishes to your Bookman. I never heard of a bush cherry. Like seeing the picture of your green roof. If I ever live where I can keep chickens, I’d want to do that. Jeane, bush cherries are large shrubs that require two for cross pollination. The fruit is tart but tasty. We weeded the green roof yesterday and now it is a sad an empty place with just a few plants. We seeded a winter rye ground cover to help keep the weeds down, we hope, until next spring when we can add more perennials and try seeding more annuals. It works great for summer insulation and we hope it works equally well for winter too! It reminds me of a cake that my wife often makes for my birthday. It is dark chocolate cake with vanilla frosting and white chocolate layers. I love the contrast. Best wishes to Bookman on his birthday. Ian, Bookman sends his thanks for the good wishes! Brian Joseph, thanks from Bookman! The cake was delicious if I do say so myself 🙂 Sounds like your own birthday cake is delicious too! At least he will remember that birthday, bee drama and all! What is National Night Out – can it really be a way of forcing people out of their homes to party??? 🙂 The cake sounds delicious! Hope you both enjoyed MOST of that exciting birthday. Happy birthday to Bookman! The cake looked delicious – although I’ve never eaten anything with vegan butter, I admit. I’m sorry about the bee stings. I’ve never even heard of bush cherries. I’ll have to look those up. Laila, Bookman says thanks for the wishes! The cake was delicious. Vegan butter is basically margarine without any kind of animal product in it (milk or milk derivatives) and in a blind taste test, no one would probably be able to tell it from regular margarine. Bush cherries are big shrubs that don’t get large enough to be called trees but they still get about 4-5 feet tall. Ours are currently waist high. The fruit is tart and tasty and critters don’t seem to interested in them which is a bonus! 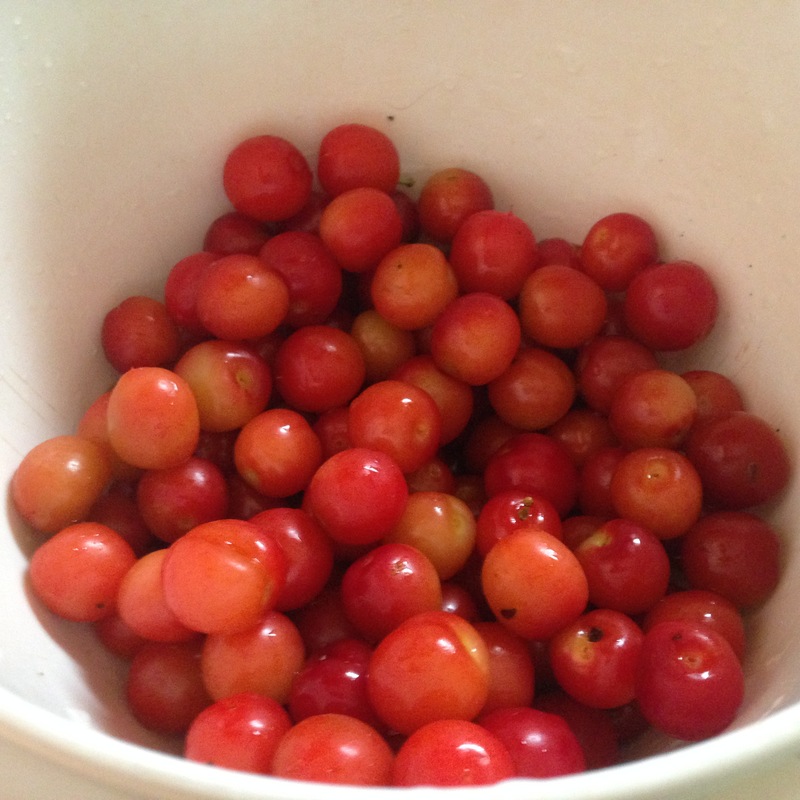 Your garden bounty looks so lovely; screw food fads, but yes yes to all of the cherry recipes flying around! Elle, Bookman says thanks for the good wishes! Given that organic cherries cost a small fortune at the market, it is nice I can grow my own. Food fad or not, I love the cherries and always have! They’re lovely. I didn’t eat cherries for years (as part of my general refusal to eat fruit or vegetables), but was introduced to them as an eighteen-year-old and wondered why it had taken me so long. A very belated but nevertheless genuine birthday wish for Bookman! May he have yet another year of culinary triumphs, awesome reading, great gardens and generally keeping up with your adventures! A very very happy birthday to him! The cake looks sinful!!!! With such ingredients, I am sure it tastes sinful as well! Happy birthday to Bookman, but oh dear the bee stings. They can e very painful, and nine is a lot. I agree with you about the superfood craze. The only positive thing about it is the you can discover some interesting new foods that you can add to your “eat in moderation” approach to life. Quinoa is one such find for me. I never did really get the goji berry one though. I hadn’t heard of the cherry one. Perhaps that’s because it’s not cherry season here yet. Will be interesting to see what happens here when the season arrives. They aren’t my all-time favourite fruit, but I do like them. Hope the humidity isn’t too bad. We’ve just had our second warmest July (remember it’s our winter) on record. Didn’t really feel like it though because it was also an unusually wet one – 71mm as against the usual 41mm – which means it was much greyer. That always makes it feel colder I think. Like today – though it’s not very warm either. 8°C at nearly 2pm is not near the forecast maximum of 13°C! whisperinggums, Bookman sends his thanks for the good wishes. His bee stings are much better and only a little tender now for which we are both grateful. Goji berries a acai were mysteries to me. Quinoa is definitely a “new” food that has turned out to be wonderful because it is so darn versatile. Chia seeds were a thing a few years ago and I am just discovering how versatile they are too. I still have a hard time getting the chia pet commercial jingle out of my head though when enjoying chia pudding. Boy, those Dashwoods have a very generous Sir John Middleton! I hope they repay their landlord appropriately! Happy belated birthday to Bookman! I had a similar birthday bee experience when I was a child. My mother was taking me and a few friends to Hershey Park for my birthday. On the way over, a bee got in the car and out of all the kids he could have stung, he stung me. Tears ensued and it set the stage for ‘what tragedy will happen on my birthday this year? !’ And there have been others more tragic. I no longer celebrate my birthday! A very happy belated birthday to the Bookman! I am glad he is not allergic to bees (like Gansey) and is experiencing no adverse effects. Will we get to see any of his tattoo when it is finished? Inquiring minds are inquiring! Jenny, Bookman send his thanks for the wishes! He has two more sessions scheduled with the artist for September and October so after it is done and healed up I will take a photo. It is rather dark and dramatic looking at the moment but the colors will purposely be fading eventually so it will look more textured and bark-like so it will be an interesting wait! Your green roof looks like my backyard. Actually I think it looks much Better than my backyard! 🙂 It sounds like you had a very busy (in a nice way–well, except for the bees attacking Bookman which was not at all nice) weekend. Your cake looks yummy. I always say, sometimes you need a little splurge, and if you are going to splurge on dessert it should be worth it. And that cake looked really worth it! I hope he had a great day. Will you and he be sharing his new tattoo? He is brave–that sounds like a lot of work (and maybe a lot of pain, too?). Danielle, heh it amazes me the places weeds will find their way to. The cake was delicious and totally worth the calories! I will share a photo of his tattoo after it is finished which will take a few sessions over the course of several months! Iliana, Bookman thanks you for the good wishes. The cake took the sting out of the stings. Sorry for the bad joke, I couldn’t resist!